If you have other characters aside from your alchemist / biochemist you may join our guild. You can PM me "Sean Cassidy" or you can ask vaz or any members with guild invite. 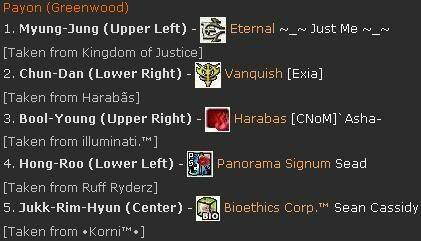 We're still in the leveling phase of the guild. Once we have an Emergency Call then we'll help the other extension guilds in leveling their guild to help us defend an agit if ever we get one hahahaha. Well good luck to us . . .
try mo nagyung wednesday phao..
wala na ako malkas na char para isalai sa woe..
woe tau sa wed! kita nalng sa juno lower right kafra..
bakit puro alche nasa bioethics? bwal alche/bio dun ah..
hahaha.. napasok ko na forums nyo.. wahahaha..
and am a corrupting influence on those around me. I am parasic and amoral. My symbol is skull. anu naman poh requird lvl nun ibang character nid 4 siege?? meron kc ako ngagamit knigth eh..
pero pansinko ala knigth sa bioethics..
COngratz sa First Agit. Galing.